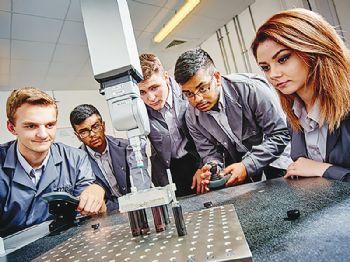 The Manufacturing Technology Centre (MTC) at Ansty Park (near Coventry) is looking for Apprenticeship Levy-paying companies to take on 60 of its ‘gold standard’ apprentices from next year’s intake. The MTC (www.the-mtc.org) is offering manufacturers the chance to use their Apprenticeship Levy to fund engineering apprentices who will get training in product design and development, plus the latest manufacturing technologies in the MTC’s Advanced Manufacturing Training Centre (AMTC), supported by Lloyds Bank. The apprentices will begin in September 2019 and will be based at the AMTC for their first year, with secondments to their host employer; they will then spend the next two years with the host employer, with block release courses delivered at the AMTC. Colin Bancroft, the MTC’s apprentice placement leader, said that the apprentices on the MTC’s programme receive a very high standard of training, using the AMTC’s cutting-edge equipment. “AMTC apprentices really are the ‘gold standard’, and they are exactly what the manufacturing industry needs to fill the high-tech jobs of the future. The MTC is looking to recruit 96 apprentices in September, with plans to triple that number by 2020. Companies interested in partnering the MTC by taking on one or more apprentices can get further information from . The MTC was founded by the University of Birmingham, Loughborough University, the University of Nottingham and TWI Ltd. It is part the High Value Manufacturing Catapult, supported by Innovate UK.